Violating the rule of law to save the rule of law? (Indonesia) | Dominic J. Nardi, Jr.
To what extent is it permissible to violate legal principles in order to save the legal system? In the U.S., we’ve often had such debates when it comes to balancing human rights during wartime, from Lincoln’s suspension of habeas corpus during the Civil War to extradition during the War on Terror. In Indonesia, legal scholars and activists are now considering whether the government should lower the presumption of innocence in order to facilitate the prosecution of corruption suspects. The Corruption Eradication Commission has used burden shifting to require corruption defendants to prove their innocence. According to The Jakarta Post, some organizations, such as Indonesian Corruption Watch, have called for expanding the use of burden shifting in corruption trials in order to prosecute more corrupt officials. However, some human rights organizations have criticized the potential erosion of criminal procedural rights. It’s an important debate and one fundamental to the rule of law. Successful legal systems tend to be able to resolve such debates and balance the needs of society with the long-term protections of the law. During my travels to Indonesia, I have seen other signs of this debate, including enthusiasm for the death penalty against persons convicted of corruption. 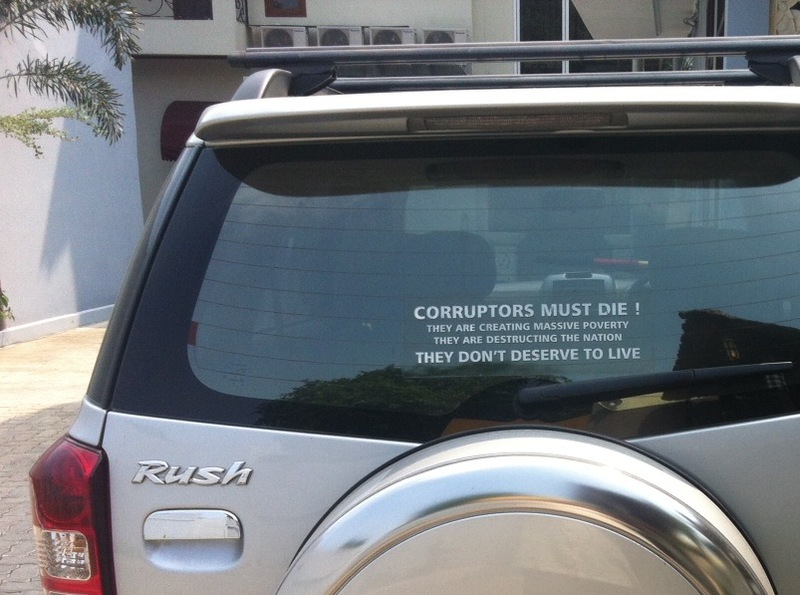 I even saw bumper stickers advocating for the death penalty (see photo). As important as it is to punish corruption, this could raise a problem if burden shifting were combined with the death penalty. It would put defendants least able to defend themselves at risk of the ultimate punishment.